It looks like the way in is not always from the beginning. This is also the first time I feel comfortable being so…. forwardly critical or (not indifferent but…) puzzled about the works of someone so well known and highly regarded. But here we go! This wasn’t actually going to get its own post; I figured it would be redundant and uninteresting and unnecessary. So I got down to writing about this week’s piece, and low and behold, the first half of the tome before I even got to the music itself was this stuff. So I figured I’d rather keep Thursday’s music post about the music and preface it with some of my difficulty I’ve been having with this guy. So here we go. I wrote about Bruckner’s sixth ages ago, and it’s not even worth considering a future rewrite as a rewrite. I should delete the original. It was a few quick listens of Solti’s reading from the Chicago box set and I wrote something to the effect of “I like it.” It should be deleted. But to be honest, repeated listenings of different recordings of different symphonies didn’t really get me much farther beyond the “I like it,” and in fact, that wasn’t even actually the sentiment. The sentiment for the sixth should have been more along the lines of “I don’t hate it,” and for the others, something like “they’re very long. And all the same.” I’d had some recording from some symphony from who knows where AGES ago of Bruckner’s ninth, and would just put it on in the car or when I was cleaning or something and let it play, and I came to enjoy the first movement. I usually didn’t make it much past that, but I at least got more familiar with the work, to some degree. That was my only real impression of Bruckner. That and the name “Mahler.” Which could have been (and still be) my problem. are fascinating. I took those entirely out of order, and attacked the fifth out of some understanding that it was one of his most famous works, and because I had the opportunity to hear it live last year. That was my starting point. Then it was number 2, 1, 6, 7, 8, 3 and 9. Roughly. I don’t know why. I have listened through Das Lied von der Erde and Das klagende Lied only a time or two, and am about as familiar with his other works, aside from Lieder eines fahrenden Gesellen, which is wonderful. I also haven’t heard a single bar of his tenth. I’m not sure why I approached them in that order, but it was how they kind of ‘came to me.’ I would have had a hard time, I think, appreciating his third or eighth or sixth without getting used to some of his other stuff first. Maybe not. I have digressed. Anyway, his works are of a similar length and a slightly earlier era are the works of Bruckner, whom Mahler admired. I had always kind of associated them as the guys that wrote the longest symphonies, and each of them with nine (give or take) of them. In reality, though, the parallels end there. They are entirely different beasts…. And that, I believe, was (is?) my biggest problem, trying to approach and view Bruckner through the lens of or in the context of Mahler. Those names had been associated with each other in my mind somehow for ages, and I couldn’t separate my expectations from what I was hearing. It doesn’t work. So don’t make that mistake. The other thing I learned, as stated at the beginning, is that while it may seem logical and organized to start with the first symphony (or one of the zero symphonies in this case) and move forward from there, it maybe isn’t the easiest way to go. While I rather like Bruckner’s first symphony, it’s mostly because of the approachableness of the first movement and the wonderful scherzo third movement. So why are we doing the fourth? Well, it was described (suggested?) to me, along with the seventh, as one of his most enduring symphonies, a work that can help me understand the composer and get what he’s all about and that it should be easier to “fall in love with.” Also, even though it carries the moniker “Romantic,” the description of this name or its context, and whatever may have existed of a storyline, gives me the impression that this is Bruckner’s pastoral, or perhaps as close as he gets to one (but again, I don’t really know his symphonies terribly well). Brahms had his pastoral last week, so there was that association for me, as well as that these pieces were published rather around the same time (in fact, next week’s piece was published before this one, but there’s a logical reason I took the liberty of switching the orders of these pieces even though this one comes a few years later; you’ll see). And there’s also some interesting intertwined connections between the composers of the next few weeks. Brahms and Bruckner obviously have their differences, and Bruckner stands solidly in the Wagner camp. There was that bit last week about the premiere of Brahms’ second being postponed for the Vienna Philharmonic to continue practicing Das Rheingold. So if Brahms took the baton (the relay race one and the musical one) from Beethoven, he certainly wouldn’t have passed it on to Bruckner, and Bruckner’s not included at all in the ‘Three Bs’, but you can certainly see how it would go Bach, Beethoven, Brahms, Bruckner… right? I do. In any case, the next few weeks will see Brahms still involved in musical history, stirring the pot and getting involved in all sorts of things. Despite his musical talents, I get the impression he was kind of a jerk. So we won’t be rid of Brahms for another few weeks, and Bruckner will live on for at least another week after this as well. So anyway, I had some misconceptions and possibly even some negative conceptions of Mahler’s works. But with concerted (pun intended?) efforts and no real direction in listening to them, I cracked them wide open and I love every one of his symphonies (some obviously more than others). Seriously, though, I’ve put some degree of the same effort and thought into Bruckner’s symphonies (mostly 1, 3, 4 [obviously], 8 and 9) with various degrees of effort, and… I’m going to be super honest. I haven’t gotten much out of it yet. The Bruckner rhythm is definitely a thing, though. So here’s the crux of the matter. He’s written the same symphony 9 times. Well, like 11 times (counting the zero and the study), and minus a quarter for the unfinished ninth, so 10.75 times. It is almost so logically and readily apparent that he’s an organist, because the orchestration, at least relative to Mahler, seems to be in big blocks, chunks, or sections, like the manuals of a keyboard. I’m making sweeping generalizations here, I know, but this is about how I see and hear it, not you. That whole ‘cathedral of sound’ thing holds true. I see (hear) it, and I get it, but it’s like a cathedral from afar, on a huge sprawling landscape: towering yes, but I don’t want to appreciate it from afar, I don’t want to see how tall and big it is from every single angle. I want to get up close, see the cracks in the brick, crunch around in the gravel around the foundation, look through the glass, smell the smells and hear my shoes clack inside. 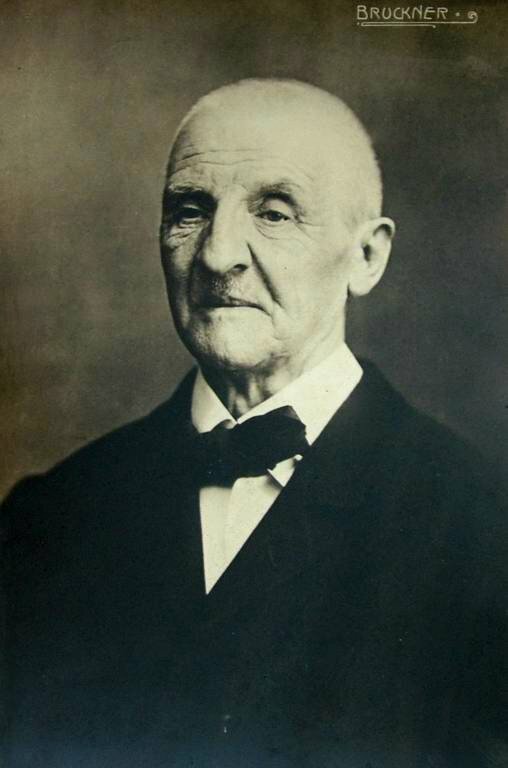 There is undoubtedly a hell of a lot of ‘bigness’ in Bruckner’s works, but I want to understand them, feel them up close, and everything seems frankly kind of distant and impersonable (which is apparently not a word), unapproachable. But that’s just me. It’s one of the reasons I was eager to try to get to know the fourth. It has a story that sounds and feels warm and personable and friendly. It is still a Bruckner symphony, though, with the same towering structure and four-movement progression. I will admit, he does a good job with his thing. It’s his music, and he does it well. I’m not criticizing his entire oeuvre. I will admit it perhaps is more my fault than his. He has his admirers, and certainly his place in this segment of European classical music history. I was hoping to have an epiphany with a piece of his or other, got some advice about getting my feet wet with the fourth, and that’s the one so far. So I was hoping to have a eureka moment, a listen where I finally GOT the piece, where it made sense, or knew how to look at it or hear it or what it is trying to say, and I think I’m there. It’s finally starting to work for me, but we’ll talk about that on Thursday.